Please excuse my lack of blogging lately… I’ve been super busy with family in town and getting things ready for Ezra’s blessing day. We had a great barbecue afterwards at our home. 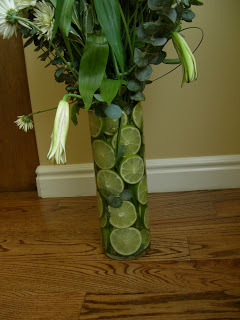 We made a great flower arrangement after an idea I saw on the hostess blog. It turned out really cute! ..and easy to make. Just slice up a fruit and wedge them in! Is there anything you can’t do? I think not. 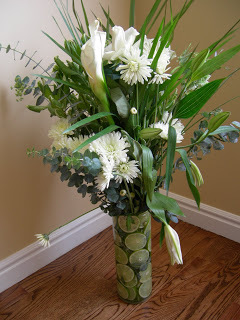 The flowers are lovely.